As part of Philippine Savings Bank’s anniversary treat, it will offer HOT DEALS on pre-owned wheels! 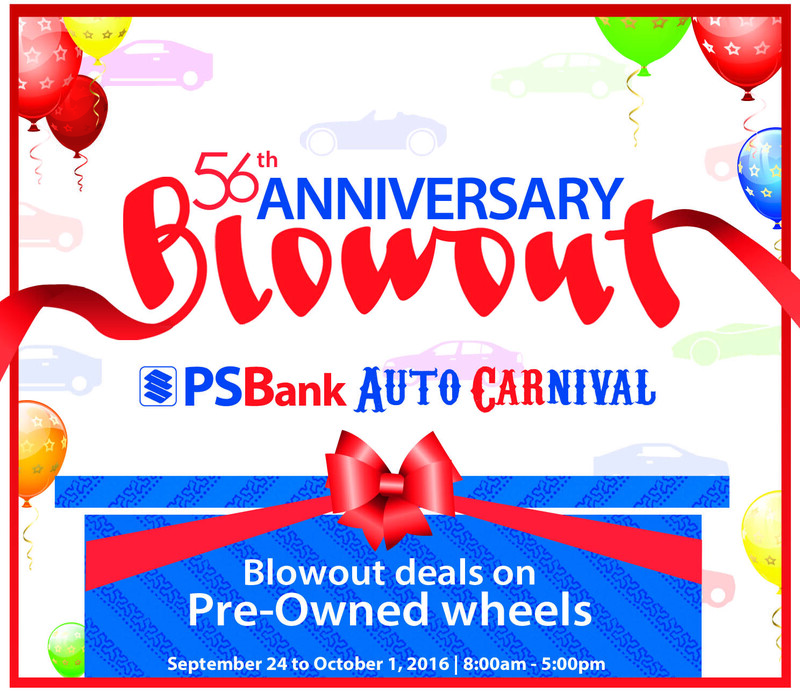 PSBank will bid out quality, pre-owned cars during the “56th Anniversary Blowout PSBank Auto carnival”—a seven-day special sale of PSBank’s repossessed cars. It will be from September 24 to October 1, 2016, from 8:00 a.m. to 5:00 p.m. (except Sundays) at the PSBank Auto Mart at #220 Mañalac Avenue, East Service Road, Taguig City. Clients who will apply for a PSBank Auto Loan product during the event will enjoy either special financing rates or avail of board rates and get free PhP3,000 worth of gas allowance, PhP2,000 worth of tint services, and PSBank umbrella. The PSBank Auto Loan with Prime Rebate makes owning a car fast and easy with its flexible payment terms and convenient modes of payment. Car buyers will get a credit decision within 24 hours from their loan application via SMS and earn rebates when they pay in advance or in excess of their monthly amortization. There will be a special bidding session on all days of the event. During the special bidding, which will take place from 8:30-9:30 a.m. only, newly repossessed cars will be up for auction and awarded immediately once results are finalized. Event visitors will also get a chance to play games, enjoy free snacks and refreshments, and win prizes. Don’t miss out on this exciting event that will allow you to finally own your dream vehicle at a very good deal!